The First Art For Arachnoiditis Project Exhibit is dedicated in loving memory to Claudine and our other Arachnoiditis Angels. Eight years ago my first Spinal Arachnoiditis Symptoms began. It was later discovered that I had been misdiagnosed and had been living with chemical meningitis without any treatment. Eventually this became Arachnoiditis in the thoracic and lumbar spine. Although I gradually developed 39 of the 52 symptoms of the Adhesive Arachnoiditis Syndrome described by Dr. Sara Andrea Jones, it took three years for me to get a confirmed diagnosis. Like many Arachnoiditis Survivors, my life was falling apart, I was in constant pain and NO ONE could/would tell me why. 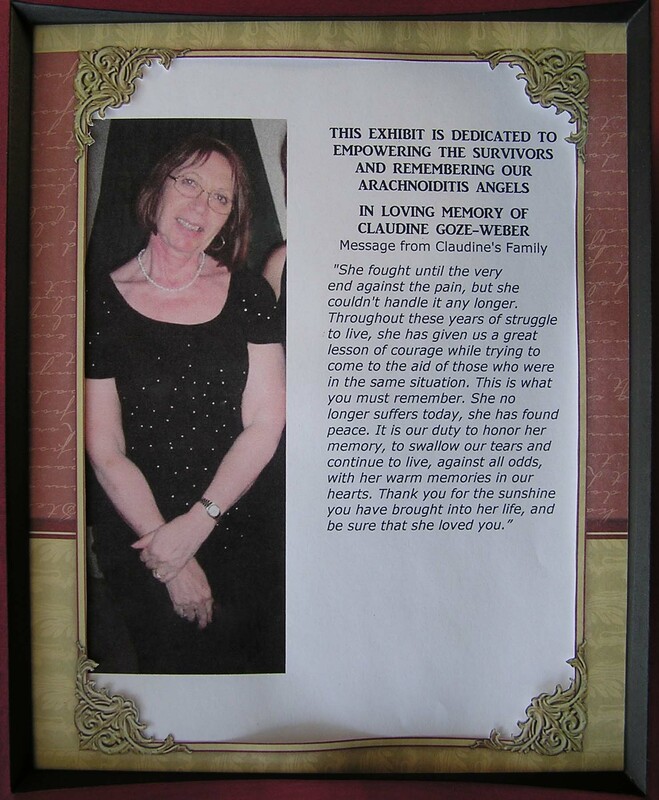 Claudine was one of several Life With Arachnoiditis support group members/survivors/advocates for prevention who helped me to keep what was left of my sanity during this devastating experience. I will be forever thankful for her compassionate, kind, gentle and encouraging words.